Summery : When Ben’s girlfriend, Marly, dies, he feels his life is over and the prospect of Valentine’s day without her fills him with bitterness. But then Marly arrives – or at least, her ghost does – along with three other spirits. Now Ben must take a journey through Valentines past, present and future – and what he learns will change him forever. 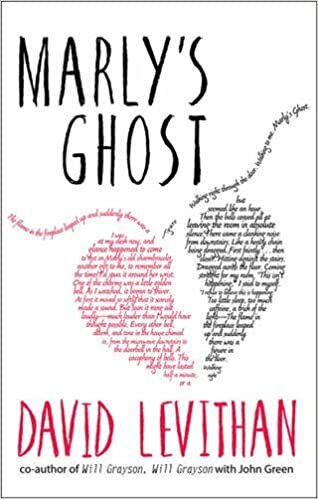 I was in need of a fairly quick read to get in to before the Halloween Read-Along this year, so I picked up Marly’s Ghost by David Levithan. Considering I am quite a big Levithan fan, I feel like I’ve not read as many of his books as I should have done. I own almost all of them but they’re all sitting on my shelf waiting to be read. Diving in to a short one seemed like a good idea even though the valentines theme was incredibly out of season in October! Marly’s Ghost is the story of Ben, a teenager who recently lost his love, Marly due to what I’m assuming was cancer. Marly sends three spirits in the months after her death to Ben to show him how his life will turn out if he keeps mourning her in the way he is doing. Marly’s Ghost is basically a very clever Valentine’s play with A Christmas Carol. I have never been a huge fan of A Christmas Carol, not once have I cheered with delight when my dad has put it on the TV on Christmas Eve. Therefore I was a little sceptical what I would make of a valentines remake of the classic story (Valentine ’s Day is also not in my list of top 5 festive seasons.) However I found the story to be refreshing and much more interesting now that there was what felt like a modern spin on it. Obviously there were clashes with the original tale, but nothing you couldn’t over look. Throughout the novel I never felt an extreme connection to any of the characters, even Ben started to get on my nerves a little bit. This is quite an unusual thing for me while reading Levithan because his characters are usually so connectable. I found my favourite to be Fred, Ben’s best friend and would have liked a lot more of his input in the novel to be completely honest. One thing that was a very nice added touch and fitting with the Christmas Carol theme was the addition of illustrations. There isn’t many images dotted around the novel but the occasional visual makes it really come to life. It was a very creative touch to a story which you wouldn’t expect to incorporate images. Overall I didn’t love or didn’t hate Marly’s Ghost. I would definitely give it another read but probably more around the fitting time of the year when I can relate to it more. Currently I’m filling my mind with pumpkins and future thoughts about Christmas! If you’re a fan of David Levithan I definitely wouldn’t hesitate to pick up this novel!